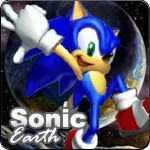 Sonic Earth - Play old school sonic game but in different layout. Sonic and Tails have crashed into earth and have transformed into humans and changed their name to fit in. Race to the end of each level destroying enemies and collecting stars on the way. Be careful the evil Dr. Robotnik has followed you to Earth!